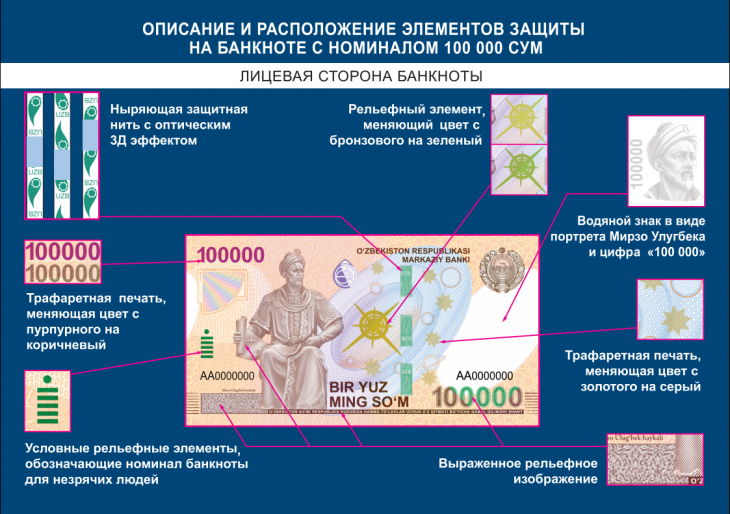 The Central Bank of Uzbekistan announced the next issue of the banknote, in denominations of one hundred thousand soums. According to preliminary data, a new banknote will be launched into circulation on February 25. The design of the banknote is dedicated to the great Uzbek scientist and grandson of Tamerlane Mirzo Ulugbek (1394-1449), it presents his main discoveries in the field of astronomy. Also in the design of the bills were used modern technology, which allowed to create 5D effects and develop a special consist for the paper on which the banknotes will be printed. The last issue of the new banknote of 50,000 was made on August 22, 2017.